Robert Ferrier holds a BM in Performance from Berklee College of Music and an MM in Jazz Composition/Arranging from UMass Amherst. 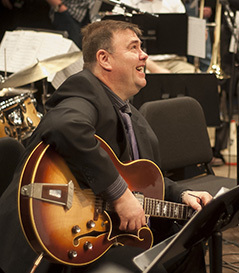 A freelance guitarist and teacher, Ferrier has performed with Jon Faddis, Randy Brecker, Eddie Bert, John Fedchock, Claudio Roditi, Yusef Lateef and Peter Erskine. His teachers have included John Laporta, William Leavitt, Herb Pomeroy, Bill Pierce and George Garzone. Ferrier is also a Professor and Coordinator of Jazz Studies at Holyoke Community College.